What do Breadwinner Women Want? 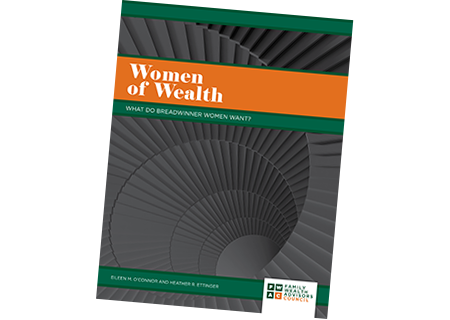 “What Do Breadwinner Women Want?” is the third in a series of studies conducted by the Family Wealth Advisors Council on Women of Wealth. This report and the first two: “Why Does the Financial Services Industry Still Not Hear Them?” and “Caught in the Middle: How Does The Sandwich Generation Woman Not Get Squeezed?” are the largest and most comprehensive studies on this topic. The results shed light on the wide variety of financial-planning needs unique to women breadwinners and inform financial advisors about how best to support their women breadwinner clients. The wealth management industry has paid a significant amount of attention to the tremendous growth in the “women’s market,” and justifiably so. Women are increasingly controlling more of the nation’s wealth, and the rise of the breadwinner woman is causing seismic shifts in our families, our communities and our marketplace. Today, among women who have a spouse or partner, more than a third earn more than their spouse or partner, and slightly less than a third earn the same amount. Nearly half enter a relationship with greater assets than their spouse or partner. The increasing number of single women in America contributes to women’s growing share of wealth. Women now are more likely to be single than they were a generation ago, whether due to being widowed, deciding not to marry, to marry later, or divorce. Whether single by choice or by circumstance, women are accruing greater wealth and playing a greater role in their financial decision making. “The Shriver Report: A Woman’s Nation Changes Everything,” Center for American Progress (October 2009). Click to view report here. Prudential Research Study, “Financial Experience and Behaviors Among Women” (2010-2011). Click to view report here. Mary Quist-Newins, “Untapped Market: Women May Be Gaining Economic Power, but They Still Feel Financial Planners Are Not Recognizing Their Potential” (March 1, 2010). Click to view report here. Women are increasingly controlling more of the nation’s wealth, and the rise of the breadwinner woman is causing seismic shifts in our families, our communities and our marketplace.